The kids were 4 months and 2 years old the last time they had to do this. In 2005 Jacob’s favorite house was the one with the toys in the living room for him to play with. We didn’t choose this pictured house, it was way overpriced. Since I started my blog in late 2007, the house-hunting experience for our family had been pretty basic: Dave would fly out to the next destination and choose a rental home for the family. I’d stay with the kids. For Dave, it was a whirlwind trip, but he could complete everything in as little as 48 hours…not just securing a new house, but also getting the boys registered for school. This next assignment to Colorado Springs would be for a longer tour than the past two, so we elected to buy a house this time. It was a tough decision, but we decided to bring the whole family on this particular househunting trip. We found a gap in the boys’ baseball schedule in early May that would allow us to take a long weekend and fly the family to Colorado; we would all shop for the next house together. We were in contact with a realtor that a local friend here recommended, and she worked with us for several weeks in advance to hone our preferences and she has a list of ten houses waiting for us to view by the first weekend of May. One of the houses went into contract right away so that left 9 houses to view. It was a very long day, and my head was swimming by the end. Ironically, we chose the one house that didn’t have an already-finished basement. The lower price made it appealing and we could apply some of the cost savings to finishing it ourselves to our liking. The kids were great sports about it. They were exhausted by the end (the high elevation not helping things) but had many inputs. It was a delicate balance of size, price, layout, schools and distance to our work locations. 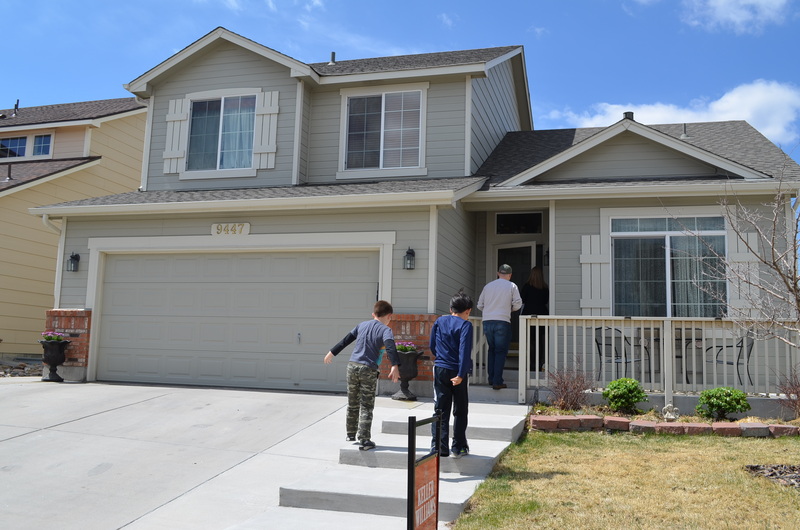 We chose a lovely house in the northeast part of Colorado Springs, centrally located. The boys can walk to their elementary schools, but will be bused or driven to middle and high school. But even the middle and high schools are closer than the kids are from their current schools. We can’t wait to make our new house a “home” in the coming weeks.